The first Indian outlet of a Swiss venture, this cafe offers a refreshing atmosphere to sink into a filling meal. The interiors look inviting with splashes of orange and yellow and comfortable couches as well as tables, both inside and outside (where you can have your meal overlooking the 100ft road - but I guess that wouldn't make for a pleasant view on a weekday, what with choc-a-block traffic on the road!). The menu listed a whole lot of options for breakfast, starters, soups, items for lunch/dinner, pastas, juices, teas and coffees. We opted for an English breakfast (just realized, I'm blogging about English breakfast for the second time...hmmm) which was scrambled eggs on toast, bacon, sausage, baked beans and juice. The eggs and bacon were well done. The baked beans tasted quite good too but I suspect this came straight out of a can :). There were also sauteed mushrooms along with the breakfast which was succulent. However, the service is quite slow at Inch. The waiters look a little lost and take ages to get your order. This kind of mars the experience of a satisfying meal. There is definitely room for improvement in this area. Our recommendation -go to Cafe Inch for the food but don't expect attentive service. You will come away with a happy tummy! So we set out to Indiranagar first thing on my birthday to collect the Exotic Fruit Gateau from Sangeeta Damani's Sweet Sins. We had read about her luscious pastries and desserts in many blogs and this seemed a good occassion to try them out ourselves. The gateau tastes best when eaten fresh and if you are planning to eat it later, it has to be stored in the fridge immediately; though we would suggest you finish it on the same day coz thats when it tastes the way it should - delicately made up, succulent and rich. This is not a place where you can drop in and have something on the go. To order cakes and desserts, you need to inform Sangeeta in advance over the phone/by email. She also has a range of meringues, pies, tarts, healthy desserts (is that actually possible? ), cookies and lasagnas on offer. Now who was that who said, "You can't have your cake and eat it too"? Edited to add: Sweet Sins has been renamed 'Spoonful of Sugar' and now serves light continental fare. 4 READERS CLICKED HERE TO COMMENT ON THIS POST. ADD YOUR COMMENT! A lazy Sunday morning in December, swathed in wollens, half awake from deep slumber we set out to a Belgian cafe in Koramangala. This suburb is teeming with a profusion of restaurants of all shapes, sizes and cuisines but most of them, according to our experience,turn out to be run of the mill with just a fancy name to attract crowds. However we were pleased to discover that Cafe De Lekkerbek lived up to its reputation and it was well worth dragging ourselves out of bed on a cold morning!! along with Calvin & Hobbes and Archie comics on one wall,this restaurant looks like the ideal place to sit with a book and coffee for hours. Gourmet, epicure or glutton - what are you? Spongy delicious muffins, perfect waffles with maple syrup along with hot tea on a wintry morning.... thats exactly what I had in the Belgian breakfast. The waffles were lovely - crisp on the outside, not too soggy, sprinkled with powdered sugar and served with maple syrup. My hunt for the perfect waffle in Bangalore is over!!! I think it's something in the air over there, what with the delicious smells of cooking wafting out of the kitchen area, I was tempted into ordering a spanish omlette despite my groaning tummy. The crunchy layers of spinach, baby corn and many more veggies makes for a scrumptious and filling meal in itself. We wolfed it down like we were starved for ages! The menu also lists food from across the continent for lunch and dinner. Their minestrone soup, banana cakes and various salads are quite popular. This is a place that definitley requires a second visit!! 7 READERS CLICKED HERE TO COMMENT ON THIS POST. ADD YOUR COMMENT! Diana Circle, Udupi - 576101. Think Udupi and think beaches, temples and gadbad from Diana!!! What better way to chill out in the sweltering weather (yes...even in the middle of December!) than stuff yourself with icecreams renowned for their quality and flavour for decades. You will find over 50 icecream delicacies in Diana's but the favourite among locals and tourists alike remains the gadbad. For the uninitiated, the gadbad is a tall glass filled with droolworthy layers of jelly, fresh fruit and dry fruits interspersed with 3 scoops of icecream. Definitely not for the calorie conscious! And it didnt help that my gadbad was topped with a yummy scoop of my favourite flavour - strawberry!! The superior quality of the icecreams - and I can vouch for that since I've been coming here every other year or so - has been maintained over the years because they are made inhouse in the factory owned by Diana. The icecreams are creamy in texture and come in a whole range of flavours from the standard vanilla to fig-n-honey. And yes, you still get tutti-fruity flavour here! I thought that flavour was extinct - long replaced by the new ones like chocomint or blueberry introduced in the metros by the bigger brands. The ambience at Diana's is unpretentious. No fussy decor, no snooty waiters. Just a clean, bustling restaurant which has retained its old world charm - and also a few of its old waiters! Vuda Complex, Siripuram, Vizag; Dwarakanagar Main Road, Opposite Titan showroom, Vizag and Lawson's Bay Colony, Vizag. Imagine savouring on spicy biryani- the recipe for which comes straight from the kings' kitchen! Well, thats exactly what you will find at Kamat Non-Veg Parcels in Vizag which has three outlets in the city. This eatery was conceived by K.Subba Raju who belongs to the Raju dynasty of Vijayanagaram that is known for its delicious Hyderabadi biryani. 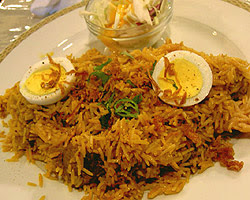 The same time-tested recipe is used to prepare the biryani at Kamat's. Kamat Non-Veg Parcels is synonymous with home cooked non-vegetarian Andhra cuisine in Vizag. Yes, all the items in the Kamat outlets are cooked under the supervision of K.Subba Raju's wife. And as the name suggests, this is a take-away place, therefore ambience and service does not count here. The food is laid out in a buffet and the customers walk in, inspect the menu of the day, place their orders and collect their parcels. Kamat's is best known for its chicken and mutton biryanis, prawn dishes and a wide range of curries. The Andhra curry menu offers chicken, mutton, fish and the very popular crab curry. The crabs are sourced from the Godavari river, which flows past the city of Vizag and the seafood comes fresh from the Bay of Bengal. We tried the chicken biryani which lived up to its reputation; the spices just right with juicy well-cooked pieces of chicken. The fish curry that we had ordered alongside was a tad too oily for our taste. But the fish was quite up to the mark and tasted good. Apart from the Andhra menu there are also some Punjabi items on offer as well as a limited Chinese menu. The food is always fresh and once an item is sold out for the day, it is not replaced on the menu. This bustling place is open from 10-30 am to 3-30 pm and then again from 6 in the evening till it closes at midnight. Kamat's offers good value for money for foodies who want to try out authentic coastal Andhra food. Fourth floor, Devatha Plaza, 131, Residency Road, Bangalore. Harima is an authentic Japanese restaurant in Devatha Plaza on Residency Road, Bangalore. Trying not to be misled by the dingy walls in the lobby of the building or the creaky elevator, we got off on the fourth floor. Once past the sliding screen door (called Shoji in Japanese), we were transported to the tranquil 'Land of the Rising Sun'! The whole restaurant is done up to reflect the ambience of a Japanese dining room. Soft ambient lighting, lilting oriental music in the background, wooden floors, paper lanterns......far from the maddening traffic just 4 floors below! We were greeted by the staff in Japanese and ushered to our table. Part of the restaurant is set up with the de rigeur tables and chairs. However, we found out that there was also a washitsu (Japanese style room) and we preferred to dine there instead. We were asked to remove our footwear at the genkan just before entering the washitsu. A genkan is a small entryway where guests are supposed to leave their shoes to avoid bringing dirt into the house/room. The washitsu has very low dining tables with floor cushions (zabuton) around them for the guests to sit on. To make it easier for guests who aren't used to sitting cross-legged on the floor, Harima actually has space below the tables (something like a depression), where you can dangle your legs, sitting comfortably, fooling others into thinking you are sitting cross legged !! The huge glass windows provide a lovely view of Residency Road. We ordered for hot sake and Maki Sushi California Roll to start with. I was a bit apprehensive about having raw fish but when the dish arrived, we weren't disappointed. The sake was mildly alcoholic. It is supposed to be consumed before having the sushi. The sushi was made of vinegared rice, avocado and seafood wrapped inside out with seaweed. It was served with pickled ginger slices, soy sauce and wasabi, which looks like our desi green chutney but don't you be fooled into spooning it generously onto your sushi roll!!! Unfortunately, this is exactly what I did and it felt like someone had shot a bullet through my brain! The 5 seconds that it took for the extremely pungent and spicy vapours to go up my nasal passage to my head felt like eternity. My life flashing before my eyes, I was about to utter some memorable last words for posterity [:P] when the effect ended as quickly as it had begun! Lesson learnt, I picked just a dot of the wasabi with my next sushi roll and it tasted divine!!! The sticky rice used in the roll is of just the right consistency and the crunchy avocado bits camouflage the fact that you are actually eating raw seafood (in this case, prawn). Our next course consisted of Sakana No Teriyaki which is the fish of the day grilled and glazed with teriyaki sauce and served with shitake mushrooms and leek. This dish is best eaten with steamed rice. Since I do not prefer main courses that taste sweet, I did not enjoy this but Balaji felt the fish was out of this world! Next on our plate [;)] was grilled tenderloin cooked in a peppery yakiniku sauce - Gyuu Rousu No Yakiniku. The tenderloin strips were well done and succelent. In fact, it tasted like juicy barbecued meat!! Dessert was Imo Youkan which is nothing but sweet potato cake. The sweet potato is steamed and cut into a thick slice. It tasted deliciously sweet as it went down my throat and was a perfect way to end our meal. Senses awakened and our tastebuds tickled, we headed home with full tummies and smacking lips! 1 READER CLICKED HERE TO COMMENT ON THIS POST. ADD YOUR COMMENT. A panda walks into a cafe. He orders a sandwich, eats it, then draws a gun and fires two shots in the air. "Why?" asks the confused waiter, as the panda makes towards the exit. The panda produces a badly punctuated wildlife manual and tosses it over his shoulder. "I'm a panda," he says, at the door. "Look it up." The waiter turns to the relevant entry and, sure enough, finds an explanation. "Panda. Large black-and-white bear-like mammal, native to China. Eats, shoots and leaves."